On February 15 the British Electronic/Synth combo Ladytron will be releasing their 6th full-length album the eponymous “Ladytron”. The album comes after an eight-year break for the members, as they return from other various side projects. As on other efforts, the band blends Shoegaze, Electro Pop and New Wave in their own unique fashion causing critics to admire their wares. On “Ladytron” that trend continues apace. Ladytron was founded in 1999 in Liverpool, UK. They took their name from the Roxy Music song of the same name as a tribute to the band that was their direct inspiration. Currently, the band is comprised of lead singer/keyboardist Helen Marnie, Mira Aroyo who also provides vocals and keyboards, Daniel Hunt on guitars, synths and vocals and Reuben Wu on synths. Over the years since their founding, they have released 5 albums with 2005‘s “Witching Hour” and 2008’s “Velocifero” drawing the most notice from critics and the public. Their inspirational muse, musical legend Brian Eno has stated about the band that, “Ladytron are the best of English Pop Music”. Notably, the band has produced a number of remixes for artists such as Depeche Mode’s David Gahan, Erasure, Goldfrapp, NIN, Placebo, Blondie, Bloc Party and Gang of Four. They are renowned and admired throughout the music world for their intuitive, ambient-tinged synth stylings. Their latest release is filled with electronic goodness that tends towards darker Gothic elements but then adds lighter vocals that produce a pop bounce. The opening songs “Until the Fire, The Island and Tower of Glass” along with the single “The Animals” are personifications of their signature stylings. Throbbing Disco beats and dance elements along with a dollop of Goth ethos are found on “Far From Home” and “Dead Zone” showing off the band’s direct connection and admiration for bands like Siouxsie and the Banshees, Blondie, and Cocteau Twins. The utilization of a Siouxsie Sioux enervated vocal approach variated with the speaking in tongues stylings of Cocteau Twin’s Elizabeth Fraser is also apparent on many tracks providing a kind of enchantress incantation feeling. The standouts of the album come late on the release with “Figurine, Horrorscope and The Mountain” which are all different in their approach but provide a distinctively alluring soundscape on each track. On “Figurine” the draw is the ethereal miasma sonic that rides over the stomping pop while lead singer Marnie discusses the topics of feminine empowerment and objectification. “Horrorscope” is a moody gothic piece that harkens to a coven gathered for a night around a smoking caldron creating suspense and drama. “The Mountain” by contrast is a mid-tempo, shoegaze filled track that delivers a clarion call of sorts and with less emphasis on the keyboards and more on layered guitars. I liked “Ladytron” but I didn’t love it. One reason being it was simply too long. At thirteen tracks it seemed a bit drawn out, shorter would have been better. Again because of the length of the album the often obscured vocals can begin to grate and take away from the lyrics. I found on some tracks that the vocals were so submerged in keyboard layering that it made the lyrics indecipherable. I can totally get into a good Glossolalia track, Elizabeth Frazer and Sarah Cuthbert-Kerr are some of the best at the art, but it felt like there were real lyrics but they were inadvertently obscured. This is the reason I enjoyed the three “stand out” tracks more than the others. All criticism aside, Ladytron is at their best when mixing their inspired keyboards with shoegaze guitar coming up with entrancing sonics. They are keeping the spirit of Ambient, Shoegaze and Electro pop that harkens to the 80’s founders of alternative music alive and well. 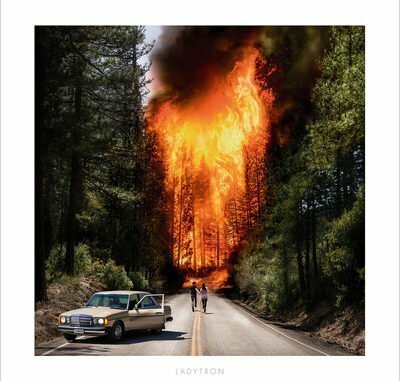 If you like 80’s digital synth with a driving relentless Gothic flair Ladytron’s latest release might just be for you.